The wolf population in Alaska's Denali National Park and Preserve plummeted to its lowest level in the park's historical record, due in part to wolf hunting and trapping inside the park and on state lands along the park boundary. Along with Yellowstone, Denali used to be the best place in the world to observe wolves in the wild - but sighting a wolf today is rare. We are calling on the Governor of Alaska and the U.S. Interior Secretary to immediately halt all wolf killing inside Denali park, and secure a permanent no-kill buffer along the park boundary from the State of Alaska. Denali National Park, a six-million-acre International Biosphere Reserve, is visited by over 500,000 people from all over the world each year. These visitors come to see North America's highest peak, its wilderness, and its wildlife—especially wolves. However, while almost half the visitors to the park used to see wolves, now only about six percent do. The wolf population dwindled from 143 to 48 in seven years. These losses have not only diminished the chance to see wild wolves, but have also undercut the integrity of the entire ecosystem—much of which is designated wilderness. While the park's primary purpose is to "protect intact the globally significant Denali ecosystems," it is failing to do so. Sign the petition to the Governor of Alaska and the Secretary of the Interior to help save these wolves immediately! Unlike most national parks, hunting and trapping is allowed on many Alaska national park lands - a political concession made in 1980. In addition, as wolves and other wildlife cross invisible park boundaries onto state lands, they are hunted and trapped for "sport" by a few local residents. The continued killing of Denali wolves has severely disrupted family group integrity, behavior, continuity, and ecology. Unlike deaths from natural causes, hunting and trapping most often kill alpha wolves, whose deaths frequently lead to the disintegration of the entire family group. In 2012, the trapping of the pregnant alpha female wolf from the Grant Creek group—who were most often seen by visitors—led to the group declining from 15 wolves to only 3 that summer. Subsequent losses to wolf family groups contributed to a decrease in wildlife viewing that is perhaps unprecedented in the history of the entire U.S. national park system. As a result, hundreds of thousands of tourists have been deprived the extraordinary opportunity to see wolves in the wild. Both the Park Service and the State of Alaska have denied repeated public petitions in the past seven years asking for a halt to wolf killing in and around Denali. Meanwhile, wolves continue to vanish from one of the nation's largest and most iconic national parks. 2. Establish a permanent wolf buffer conservation easement from the State of Alaska along the northeastern boundary of Denali, where most hunting and trapping occurs. If you'd like to learn more about Denali's famous wolf family groups, check out our book, Among Wolves. The wolf population in Alaska's Denali National Park and Preserve has plummeted to its lowest level in the park's historical record, due in part to wolf hunting and trapping inside the park and on state lands along the park boundary. Along with Yellowstone, Denali used to be the best place in the world to observe wolves in the wild - but sighting a wolf today is rare. We are calling on you to immediately halt all wolf killing inside Denali park, and secure a permanent no-kill buffer along the park boundary from the State of Alaska. Denali National Park, a six-million-acre International Biosphere Reserve, is visited by over 500,000 people from all over the world each year. These visitors come to see North America’s highest peak, its wilderness, and its wildlife—especially wolves. However, while almost half the visitors to the park used to see wolves, now only about six percent do. The wolf population has dwindled from 143 to 48 in seven years. These losses have not only diminished the chance to see wild wolves, but have also undercut the integrity of the entire ecosystem—much of which is designated wilderness. While the park’s primary purpose is to “protect intact the globally significant Denali ecosystems,” it is failing to do so. Both the Park Service and the State of Alaska have denied repeated public petitions in the past seven years asking for a halt to wolf killing in and around Denali. Meanwhile, wolves continue to vanish from one of the nation’s largest and most iconic national parks. 2. Acquire a permanent wolf buffer conservation easement from the State of Alaska along the northeastern boundary of Denali, where most hunting and trapping occurs. This easement can either be purchased by the U.S. government, or transferred from the state in exchange for an equal-valued federal easement or asset elsewhere. 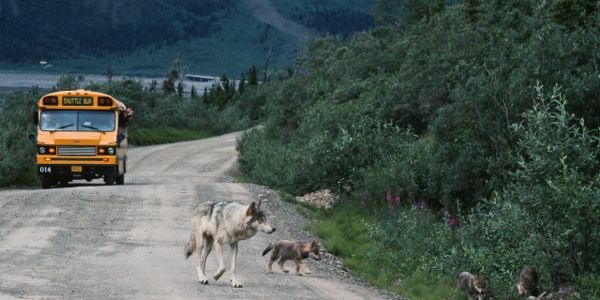 This has been a brutal winter for Denali's wolves. More than 8 Denali National Park wolves have been killed by trappers/hunters along the park boundary. Finally, today, the Governor of Alaska issued an emergency closure of trapping and hunting, but just for the remainder of the spring 2018 season. Hunting will resume in August, and trapping in November. So, we are redoubling our efforts to make this a permanent closure so that Denali wolves are finally, once and for all, protected! Promising news: I’ve presented the petition to Alaska Governor Walker, and - FINALLY - discussions are now underway for the Denali conservation easement. But we have to keep the pressure on. So please, keep sharing this petition and keep emailing NPS and the Governor - they're listening! Sad news: a trophy hunter just shot the last male of the Toklat family group. NPS and Alaska need to get the conservation easement in place NOW!